Dolores Marlene Pankrantz was born on September 17, 1935 to Leo and Mary Pankratz in Pittsville, WI, Dolores died at home with her family around her on 22 Oct 2011, of a lengthy illness. Dolores was the second of twelve children, and grew up in Molalla, Oregon. Coming from a large family, Dolores was a people person and loved nothing more than being surrounded by friends and family. She loved to travel, and toured Europe, Eastern Europe, the Mediterranean, and Mexico, often stopping to meet the people and learn of their culture. She greatly enjoyed going to garage sales and swap meets, just to meet new people and hear their stories. 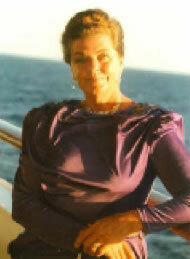 Besides raising a family of five children (and several strays in the process), her affinity for people led her to a number of related careers: Dolores worked in reality for Century 21 in Vista, CA, ran a wedding chapel, Riverview in Bonsall, CA, as well as managed her own restaurant in Vista. She worked for many years as a receptionist and assistant in her husband's chiropractic office in Vista, Hal Jensen Chiropractic, where her natural charm and empathy for people drew as many patients to the office as her husband's much-acclaimed talent in chiropractic. Dolores was an avid horseback rider, and only gave it up in the last few years of her life as she became too frail to continue. She was a licensed private pilot (and quite proud of the fact), accomplished in water-skiing, gardening and cooking, and was a marvelous singer, often compared to Patsy Cline, her favorite vocalist. She greatly enjoyed reading of faraway places, and then spending months planning the trips to see them. Preceded in death by her parents, Leo and Mary Pankratz, as well as her youngest child, Harold Pritchard, Dolores is survived by her husband, Dr. Harold (Hal) Jensen of Inyokern, CA, two sons Bernard Pritchard of Ridgecrest, CA, Mark Pritchard of Bonsall, CA, as well as two daughters, Margie Welsh of Nova Scotia, Canada and Carol Pritchard of Inyokern. Her surviving siblings are brothers William, Richard, Robert, James, Michael and John Pankratz and sisters Sally Kemple, Susan Wadle and Margaret Palfrey, as well as beloved uncle and aunt Bob and Ruth Nash of Ridgecrest. Dolores was blessed to have seen 13 grandchildren and 21 great grandchildren.